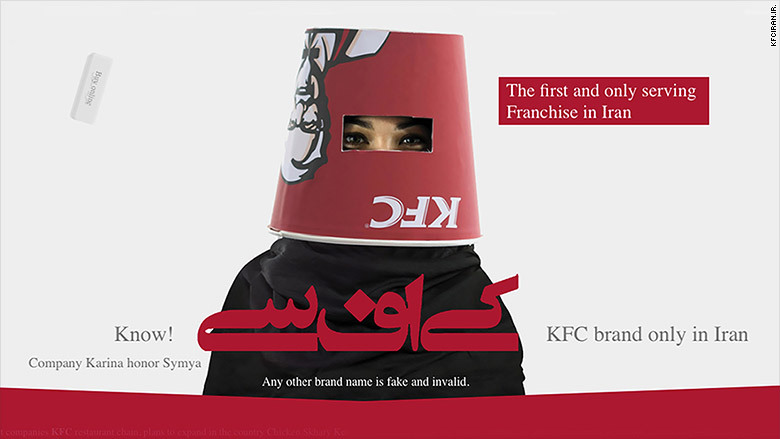 A website advertising a KFC restaurant in Tehran, Iran, was suspended Tuesday. A KFC-branded restaurant was shut down in Iran on Tuesday roughly 36 hours after opening for business, according to local media. The restaurant created a stir on social media and raised alarm among conservatives who are wary of what they regard as unwanted American influence. The owner told Tasnim News the closure was the result of a "miscommunication," since his business was not affiliated with KFC, but rather with a separate restaurant in Turkey which uses the KFC name. He told the website that he didn't have any dealings with the American KFC chain and would consider it a competitor. But his website -- kfciran.ir -- clearly used an image of Colonel Sanders to indicate the restaurant location on a map of Tehran. The website has since stopped working and a message says the account has been suspended. KFC's parent company Yum! Brands (YUM) said it is planning legal action against the people behind the restaurant. "We are shocked by the news that an illegitimate KFC outlet has opened in Tehran," Yum Brands told CNNMoney. "No franchise rights have been granted to any party in Iran." CNNMoney could not reach the Iranian restaurant owner for comment. The closure comes just weeks after Iran and the West struck a historic nuclear deal. However, relations between the U.S. and Iran remain frosty. The head of Tehran's food producer association, Assadolah Ahmadi Shahrivar, told the semi-official FARS news agency that various American fast-food chains had been looking to establish themselves in Iran in the past few weeks. "But foodstuffs and chain restaurants will not be permitted to open here," he was quoted as saying. He said the restaurant was not given a permit to operate, though the owner claims to have the correct papers. "If the permit is proven to be fake the restaurant will be immediately closed down, otherwise the restaurant will have 15 days within which to obtain a permit," he was quoted as saying. --CNN's Shirzad Bozorgmehr contributed to this report.